Why Golf when Your Hands Get Numb and Hurt After a Round – We have the Solution. There is a lot of vibration that comes through the club shaft at impact and into the golfers body. The whipping action of the shaft can deliver a significant amount of vibration. Shaft vibration dampening is the process of placing specially developed foam inserts into the club shaft. They are virtually weightless (1 – 2 grams) and do not affect swing weight. These inserts are installed inside golf club shafts to dampen the vibrations that occur when hitting the ball and/or the ground. If you’ve ever experienced pain in your elbo w, wrists, hands, or shoulders during or after a round of golf, you could be a candidate to use inserts. Golfers with tendinitis, arthritis, or any other joint pain are amazed at the effectiveness of this product. Older golfers experiencing fatigue from continued hitting could gain from inserts. Even if you are concerned about the cumulative effect of the jarring that can occur on every golf shot, the inserts can be a great preventative measure. In the majority of cases, inserts are installed into irons including wedges and even putters – basically any club with a steel shaft. They also can be used in graphite shafts. Albeit, graphite shafts by their nature, already have some vibration dampening qualities inherent with their design. The benefits are more significant when installed in steel shafts, but many of our customers can still feel a noticeable difference when installed in graphite shafts as well. Keep in mind, that the feel of vibration in the shaft often provides the golfer with a lot of feedback into his or her swing. For golfers that rely upon this feedback – you may want to consider using them in certain clubs only, or not using them at all. In any case, on cold, damp, or humid days – you don’t necessarily want to feel the vibrations. It is a personal choice, but excellent for older people or those folks with physical swing pain issues. There are also a number of manufactured club set offerings that come with vibration dampeners already installed. But, the price of these clubs tends to greatly exceed the cost of a club technician installing them. We utilize one of two different dampening system types: ProSoft and True Temper. 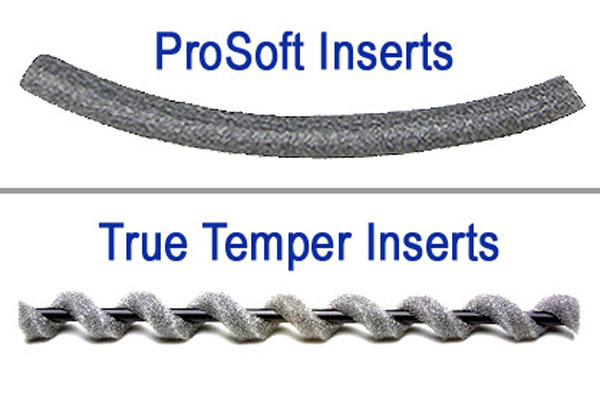 True Temper inserts are patented and can cost $36.00 for a set of 8. ProSoft inserts are a much less expensive option and perform nearly as well in our tests. These run $16.00 for a set of 8. Installation for either type of insert is a $5.00 per club fee. Grips need to be removed and re-installed during the installation process. This would be an ideal time to change into new grips. NOTE: We do offer you the opportunity to purchase these inserts in lesser quantity or even for a single club.